That’s how today is going to be marked in this little corner of the blogosphere. I have been lucky to get some fantastic comments today on two of my posts. David wrote a very insightful comment about the difference between audiences taking a reactive and a proactive stance towards privacy issues on my post about Facebook. He also gave the best justification for the “death knock” (when a journalist calls on a recently bereaved family) that I’ve seen yet. Jon Walker and Markmedia also left fantastic comments on the post discussing the lack of business knowledge amongst many journalists. Jon argues that journalists have very little impact on business decisions and is concerned the production of good content might not be enough to save the industry. Mark argues collective union action to focus on business strategy would empower journalists. Both have also turned their comments into blog posts (Jon | Mark), which are also worth a look. What is going on with WordPress Stats? What does it mean?! What are Region A and Region B? 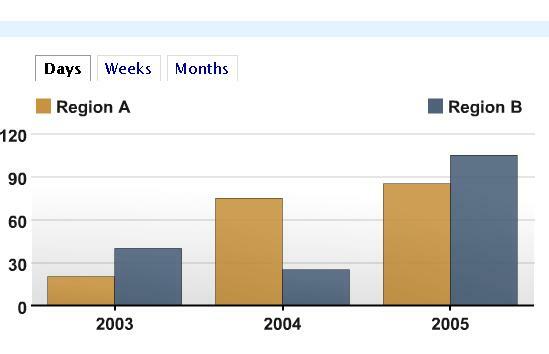 And why were they doing something in 2003 – 2005 when my blog wasn’t even a twinkle in my eye?! When I refreshed the graph went back to normal, but I’d love to know if anyone else has had something similar or knows why it might have happened. Phew! The first day of the residential is over. So, before a large glass of wine helps me to forget everything we’ve learnt today, I thought I better write a few quick notes. The biggest thing for me was how much technology is out there that journalists should and could be using right now. I remember being very impressed when playing with Google Earth on a friend’s iPhone – the GPS functions was stunning (Any rich person got an iPhone going spare btw? I’d love one, but can’t afford it!). It was brought home to us today that in just a few months everyone will have mobile GPS on their phones and will start expecting information to be geotagged. We should be doing that now! Another one was mobile video. Here is another view of Preston (can’t get it to embed) and our lecturer Mark streaming video from his Nokia N95, which is now part of the mobile kit for all Reuters journalists. Mark’s using Bambuser, which streams driectly to the web. It is still in alpha so, as with Seesmic, I’m going to have to put it on the list to play with later. But it made my head spin to think how easy it is to capture breaking news on mobile video and have it online instantly. Other good sites to play with: Jaiku and ShoZu. Before the former secretary of an Australian toastmasters club beat me to it, I have registered www.joannageary.com. At the moment it points to this here blog and, I suspect, that’s exactly how things will stay for the forseeable future. The old one http://joannageary.wordpress.com still works, of course. So…not really news I suppose, but it’s the first time I’ve registered a domain name, so I felt the need to share. Well, Mr Scotney may have evaporated from the blogosphere (I am assured it’s temporary, with a new blog due in the new year), but now Post journalist Rhona Ganguly has stepped up to the plate and launched her own independent blog. Community Affairs in the Second City deals with the issue of social cohesion in Birmingham – a subject I know Rhona feels very passionate about. One of her first posts is a thoughtful response to an appalling story that appeared on the front page of the Daily Express some weeks back. Not only does the article make ridiculous and inaccurate statistical assumptions, but it is also inflammatory and, above all, an insult to journalism. Grrr. I find it hard to write about such things as it just makes my blood boil. Luckily Rhona is far more clear sighted.